New Delhi, June 2, 2014 – Building on the success of the Stellar range of smartphones, Spice Retail Limited, India’s leading mobile internet company today unveiled Spice Stellar 360, the 3G touch and type QWERTY phone under its Stellar series. Coupled with advantage of 3G network, this new dual sim Android Jellybean smartphone runs with 1.3 GHZ dual core processor and comes with an efficient Opera Mini browser for a better browsing experience. Its advanced VA display offers rich and dynamic colors with greater depth, along with higher contrast ratio, better image quality and a wider viewing angle. The unique feature of this smartphone is its combination of a touch-sensitive screen and a user-friendly QWERTY interface, offering users more choices in the way they use their smartphones. Free BBM to BBM voice calls makes this device even more appealing. 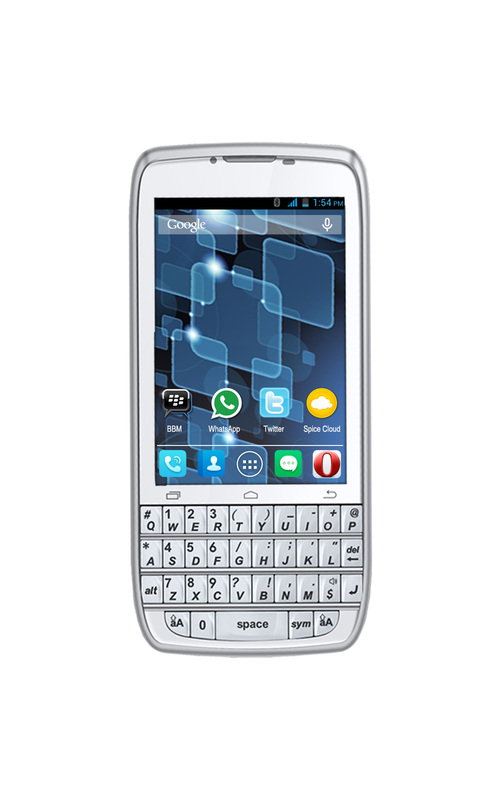 Spice Stellar 360 sports a 3.2 MP camera with a 1.3 MP front camera and comes with pre embedded applications such as Whatsapp, BBM, Opera, Twitter and utility apps like Spice Cloud, Getit, and OLX. BBM to BBM free voice call can be enjoyed through this phone. Owing to the 3G connectivity this smartphone offers faster browsing experience and lightning speed download, keeping pace with the demand of the GenX. The handset also comes with certain other fascinating features as well, such as Flip to Mute, Pop-up Play, Intelligent Answer, etc. It has advanced sensors like Proximity sensor and G-sensor amid other attractive features. On the storage aspect, Spice Stellar 360 has an inbuilt memory of 4 GB ROM + 512 MB RAM which can further be expanded upto 32 GB with a microSD card. The phone also has a Mali 400 GPU for better gaming experience. Stellar 360 comes along with a Free Pouch worth Rs. 500/-. The BBM to BBM free voice call service makes the device more tempting, especially for the youth. It has been quite some time now that android smartphones come embedded with BBM and allied features. Apart from these, this new smartphone gives access to Spice Cloud that gives the user 2 GB free storage space and enables them to access data on multiple devices. Users can access them using the web interface at www.spicecloud.in. With an MOP of Rs. 4,799/- the Spice Stellar 360 will be available across India through www.amazon.in and www.saholic.com.